A stunning collection of top-class mares will be offered at this year’s Inglis Chairman’s Sale, for which the catalogue is now available online. In total 53 lots have been collated for the boutique sale, which will take place from 6.30pm on Friday May 3 at Riverside Stables. There are also many more quality mares in foal to the likes of Snitzel, I Am Invincible, Zoustar, Written Tycoon, Exceed And Excel, Russian Revolution, Merchant Navy, Pierro, Dundeel, No Nay Never, Brazen Beau, Impending, Deep Field and Capitalist catalogued for the Chairman’s Sale. The sale will begin with a nomination to Widden Stud’s hot new first season sire, four-time Group 1 winner, Trapeze Artist for the 2019 Australian breeding season, with all proceeds going to injured jockey Tye Angland. The other stallion offering is one share in the Russian Revolution stallion syndicate, likely to be much coveted, entitling the owner to two nominations per season until the 2021 season and thereafter one nomination per season. Additional wildcard entries will be considered up to April 22. To discuss wildcard entries, please contact a member of the Inglis Bloodstock Team. 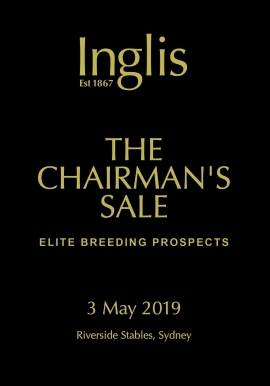 To view the Chairman’s Sale catalogue, CLICK HERE. And a total of 619 entries – 257 weanlings, 361 broodmares and a share in Sizzling - have been catalogued for the Australian Broodmare and Weanling Sale, which will book-end the Chairman’s Sale. The weanlings include those by leading sires such as I Am Invincible, Zoustar, Fastnet Rock, Written Tycoon, Medaglia d’Oro, Lonhro, Hinchinbrook, So You Think, Pierro, Sebring, Dundeel, Nicconi, Brazen Beau, Deep Field and Better Than Ready as well as first crop offerings for the likes of Capitalist, American Pharoah, Astern, Extreme Choice, Flying Artie, Shalaa, Maurice, Star Turn, Divine Prophet, Winning Rupert, Xtravagant, Territories, Mikki Isle, Sooboog, Stratum Star and Odyssey Moon. The sale will begin with weanlings being offered on Thursday May 2 at Riverside. As part of the broodmare section of the catalogue there are mares in foal to the likes of I Am Invincible, Sebring, Lonhro, So You Think, Dundeel, Brazen Beau, Deep Field, Nicconi, Capitalist, Better Than Ready and Rubick as well as first season sires like Russian Revolution, Merchant Navy, Hellbent, Invader, Caravaggio, Churchill, Ribchester, Pariah, Impending, Highland Reel, Jukebox, Menari, Spieth, Tosen Stardom etc. Fillies and Broodmares as part of the Australian Broodmare and Weanling Sale will be offered on Sunday and Monday, May 5 and 6. Supplementary entries for the Australian Broodmare and Weanling Sale will be accepted until April 22. To view the Australian Broodmare and Weanling Sale catalogue, CLICK HERE. Hard copy catalogues for both the Chairman’s Sale and the Australian Broodmare and Weanling Sale will be available within a fortnight. To order one, email catalogue@inglis.com.au or contact our Sydney reception on +61 2 9399 7999.